Background : Minimally invasive parathyroidectomy (MIP) is widely used worldwide for the treatment of primary hyperparathyroidism (pHPT). It is usually combined with a perioperative adjunct for high success rate. Aim : To demonstrate that MIP can be successfully performed in a selected group of patients with presumabally solitary adenoma as the cause of pHPT without using any perioperative adjuncts. Settings and Design : A prospective data analysis of two surgeons' series from a teaching hospital in Turkey. Materials and Methods : Of the 47 patients referred with a diagnosis of pHPT during January 2004-May 2008, 30(63%) patients with sporadic pHPT with presumed solitary adenoma were included for analysis. These patients underwent MIP via focused lateral ( n=24) or anterior ( n=6) approach. 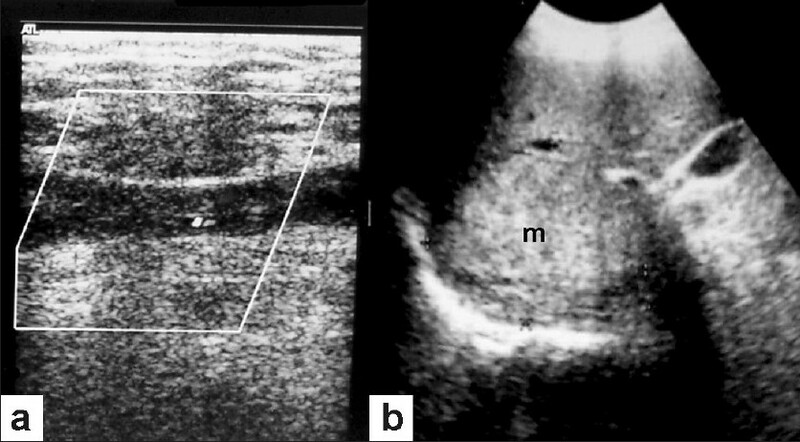 Preoperative localization was done using 99 mTc-labelled sestamibi scan and ultrasonography. Only patients with concordant tests for single adenoma were selected for MIP. Serum parathyroid hormone and calcium levels were measured postoperatively and at follow-up visits. Statistical Analysis : Parametric data presented were analyzed with Excel XP (Microsoft, Redmond, WA, USA). Results : Barring one patient, all other patients were initially biochemically cured by MIP. 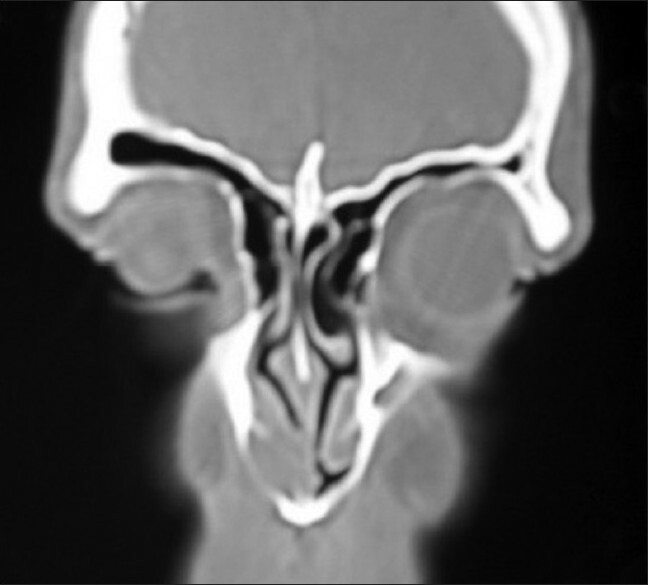 One patient remained hypercalcemic, who was found to have a second adenoma at the second operation. During a mean follow-up of 16 (3-55) months, all patients were normocalcemic with a mean serum calcium level of 9.4 (8.9-10.2) mg/dl. Parathormone levels were persistantly elevated only in one patient (3.4%). No postoperative permanent complication was encountered. Conclusion : The results of MIP achieved in high-volume endocrine surgery centers can be replicated in low-volume center without any intraoperative adjuncts, in patients with overt clinical pHPT and concordant results of sestamibi and ultrasound. Background : Primary central nervous system (CNS) lymphoma is being increasingly recognized in immunosuppressed as well as immunocompetent individuals. It has a poor prognosis and the majority of these have diffuse large B-cell type of morphology. Aim : To categorize cases of primary CNS lymphoma according to the International Extranodal Lymphoma Study Group (IELSG) score and to correlate the score with reactive CD3 collar around blood vessels and necrosis. Materials and Methods : We reviewed the clinico-pathological, morphological and immuno-histochemical features of 30 cases of primary CNS lymphoma reported at our institute in the last nine years and categorized them according to the score given by IELSG. Results : All our cases were HIV-negative and had diffuse large cell histology. Twenty-seven of the 30 cases were associated with poor prognostic factors of intermediate to high risk according to the IELSG score. 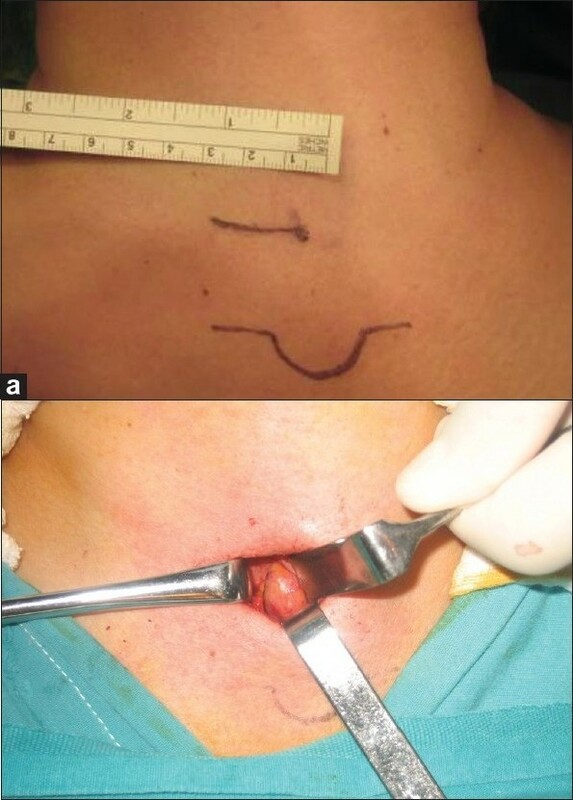 Reactive CD3 collar around the blood vessels was seen in seven cases which had low to intermediate IELSG score. However, no significant statistical difference of perivascular reactive CD3 collar and necrosis was seen with IELSG score. Conclusion : Approximately 90% (27 cases) were associated with poor prognostic factors in the present study according to the IELSG score. Perivascular reactive CD3 collar was seen in cases with low to intermediate IELSG score. A larger study is required to further validate that the presence of reactive perivascular CD3 collar is associated with good prognosis. 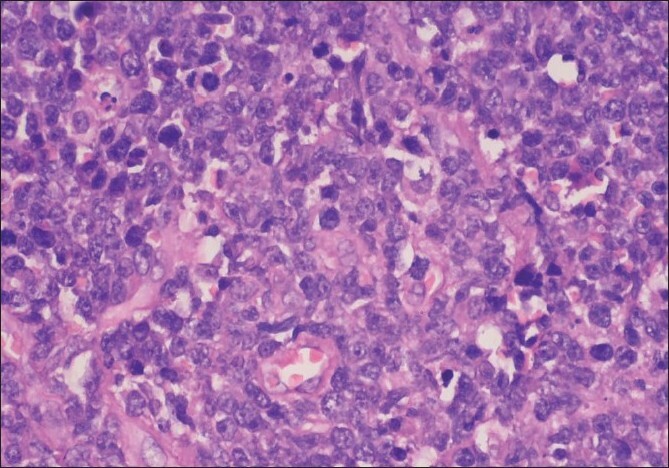 This histological marker could be supplemented with IELSG score to stratify the patients of primary CNS lymphoma according to their aggressiveness. Background : Aspirin resistance is a major problem and its incidence and clinical significance in Indian patients with documented coronary artery disease are not known. Aim : We sought to study the incidence of aspirin resistance and its clinical significance in a cohort of Indian patients with coronary heart disease on therapy with aspirin using urinary 11-Dehydrothromboxane B2 levels as a surrogate marker for antiplatelet efficacy. 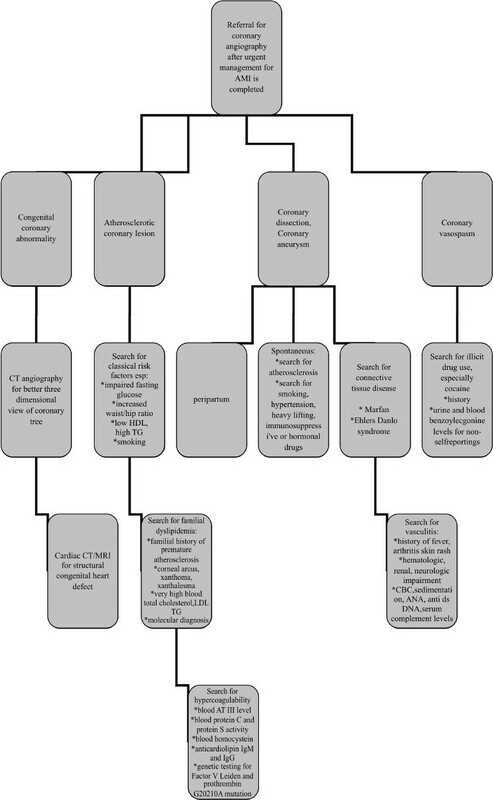 Setting and Design : Non randomized single center prospective study in cohort of patients with stable cardiovascular disease on chronic aspirin therapy attending the cardiology outpatient clinic of a tertiary care hospital. Materials and Methods : Urinary dehydrothromboxane levels were analyzed in a cohort of 63 patients with stable documented coronary artery disease and in 21 healthy volunteers. The cases were followed up prospectively for a median period of 36 (1-53) months. The clinical endpoint was a composite of acute coronary syndrome, stroke, revascularization and death. Statistical Analysis : Comparison of urinary dehydrothromboxane concentration values between various risk factors was done using Mann Whitney U test, a non parametric alternative of independent t test. All statistical analyses were done using SPSS 11.0 (Chicago, USA) software. Results : The median (range) absolute values of urinary11- dehydrothromboxane B2 levels for the healthy volunteers and cases were 440 (286-2050) pg/ml and 320 (72-2600) pg/ml (P=0.007). The corresponding normalized values were 87.3 (43-143) and 60.8 (16.7-943) ng/mmol of creatinine (P=0.131). Among the various vascular risk factors, patients who were overweight had higher absolute levels of 11- urinary dehydrothomboxane B2 levels (P=0.016). There were significantly more clinical events in patients with absolute urinary 11-dehydrothromboxane B2 levels in the upper two quartiles compared to the lower two quartiles (P=0.04). Conclusion : The incidence of aspirin resistance in the cohort of patients with documented heart disease was 38.1%. 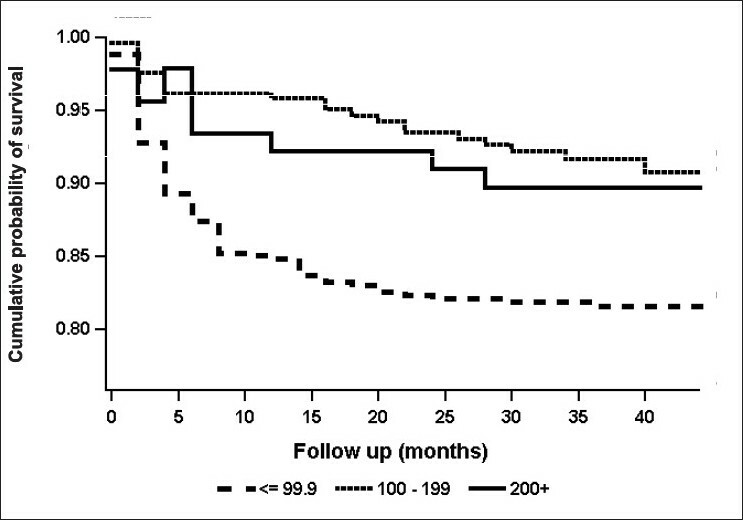 Patients with elevated absolute urinary dehydrothomboxane levels (>320 pg/ml) on chronic aspirin therapy constitute a high risk subset for recurrent vascular events. Background : Gabapentin has been recently found to be useful for reducing acute postoperative pain when administered preoperatively. 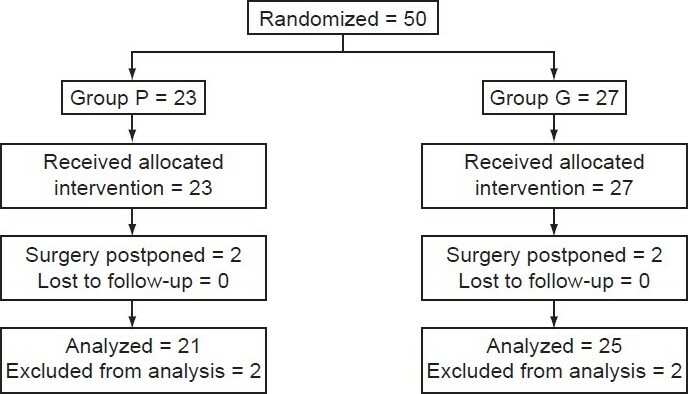 Although various dose regimens have been tried in different surgical settings, the minimum effective dose is not established. Aims : We aimed to evaluate the analgesic efficacy of single low dose gabapentin in patients undergoing total mastectomy and axillary dissection. Settings and Design : Prospective randomized placebo-controlled double-blind trial in a tertiary care teaching hospital. Materials and Methods : Fifty women scheduled for total mastectomy and axillary dissection were randomized to receive either gabapentin 600 mg or placebo orally 1 h preoperatively. The intraoperative and postoperative management was standardized. Postoperative pain was assessed at rest and on movement for 12 h using the numerical rating scale (NRS). Morphine was administered if NRS exceeded 30. Primary outcome measure was total morphine consumption. Statistical Analysis : The morphine consumption was compared using independent t test while pain and sedation scores were analyzed using Mann-Whitney U test. Results : Forty-six patients completed the trial. The postoperative morphine consumption was significantly less (5.8 ± 4.2 vs. 11.0 ± 3.4 mg; P < 0.001) and the median [IQR] time to first analgesic was significantly longer (90 [37.5-120] vs. 0 [0-90] min; P < 0.001) in the gabapentin group than in the placebo group. The incidence of side effects was similar in the two groups. Conclusions : A single low dose of 600 mg gabapentin administered 1 h prior to surgery produced effective and significant postoperative analgesia after total mastectomy and axillary dissection without significant side effects. Background : Estimation of CD4 cell count remains the primary monitoring tool in assessing efficacy or failure of Anti Retroviral Therapy (ART) under national program conditions in India. Aims : To study the average trajectory of CD4 cell count after two years of initiation of potent ART and to find the determinants of CD4 progression over time. Settings and Design : A prospective cohort study under program conditions. Materials and Methods : Adult ART naïve patients, receiving drug regimens consisting of two NRTIs and one NNRTI were studied for CD4 progression. Laboratory monitoring included the baseline and follow-up CD4 cell count, hemoglobin level and absolute lymphocyte count estimation. The change in CD4 cell count, hemoglobin and bodyweight was calculated from the baseline to the latest follow up measurements. Statistical Analysis : Survival curve using Life table methods was plotted. Comparison between survival curves was done using Tarone-Ware statistics. Generalized estimating equation with exchangeable correlation structure was done to find the risk factors for CD4 progression. Results : Among 7,934 HIV positive patients in the ART program, one-year cohort of 714 adult patients who had completed two consecutive follow-up CD4 values were assessed. Those with baseline CD4 < 100 had cumulative probability of survival 85%, 82%, 82% and 82% at 12, 24, 36 and 42 months respectively. Those who had baseline CD4 count between 100-199 had cumulative probability of survival 96%, 93%, 92% and 90% at 12, 24, 36 and 42 months respectively (P< .001). Lower the CD4 count (< 100) lower the hemoglobin values. Conclusions : CD4 progression continues two years after ART in patients who had base level > 100 cells. Early initiation of ART is necessary before CD4 crashing to < 100 cells for increasing the survival function. 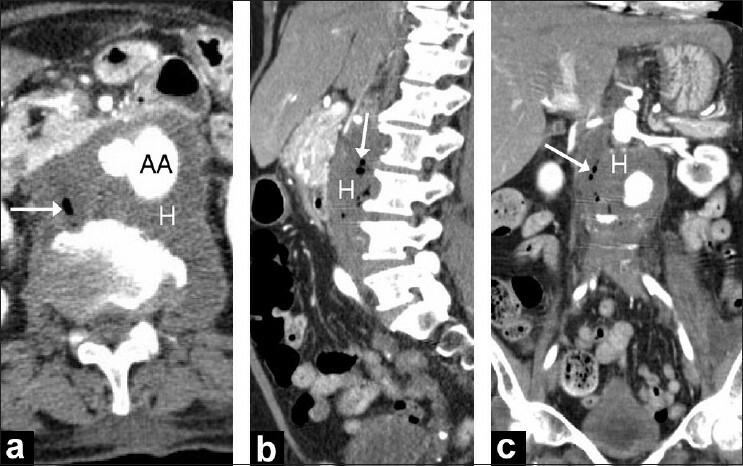 A 70-year-old lady presented with recurrent gastrointestinal bleeding and septicemia caused by multiple enteric pathogens. She was diagnosed to have primary aorto-enteric fistula (PAEF) complicating abdominal aortic aneurysm. Endovascular aneurysm repair was carried out that arrested gastrointestinal bleeding, but despite prolonged antibiotic therapy the patient died a month later of probable sepsis. PAEF refers to abnormal communication between the aorta and the intestine resulting from disease at either site; this rare condition should be suspected in patients with abdominal aortic aneurysm who present with unexplained life-threatening gastrointestinal bleeding. Computerized tomography is the most sensitive investigation. Presence of ectopic gas adjacent to or within the aorta and of contrast within the gastrointestinal tract is the pathognomonic finding. Definitive treatment consists of surgical intervention, but it is associated with high risk in the acute setting. Endovascular therapy using stent-grafts is safe and effective in arresting gastrointestinal bleeding. However, it is frequently associated with recurrent sepsis even with continued antibiotic therapy, and should be considered as a bridge to more definitive surgical repair at a later time, after optimization of the patient's condition. 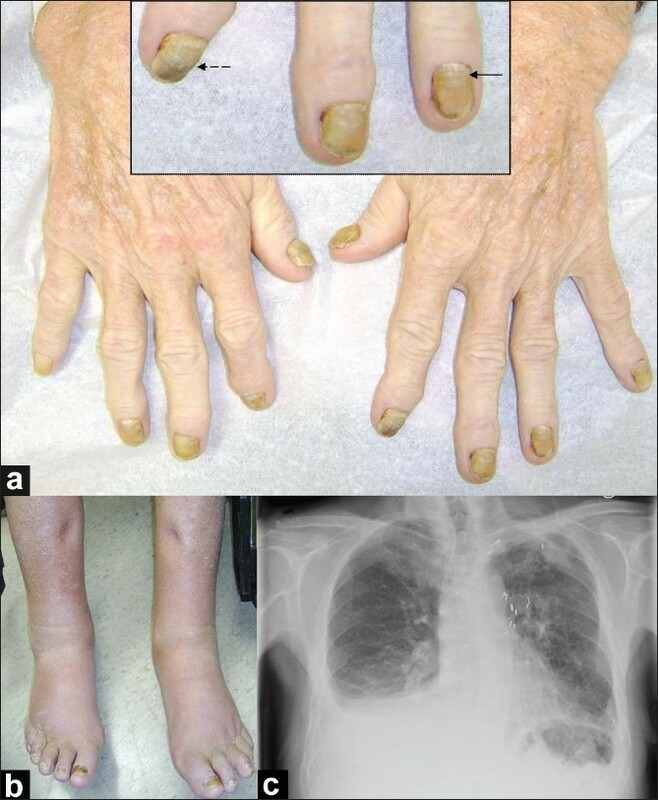 An 80-year-old man presented with the characteristic triad of yellow nail syndrome (chronic respiratory disorders, primary lymphedema and yellow nails) in association with coronary artery bypass graft surgery. Treatment with mechanical pleurodesis and vitamin E resulted in near complete resolution of the yellow nails, pleural effusions, and lower extremity edema. The etiology of the yellow nail syndrome has been described as an anatomical or functional lymphatic abnormality. Several conditions have previously been described as associated with this disease. This is the first report of the association of this syndrome with thoracic surgery. 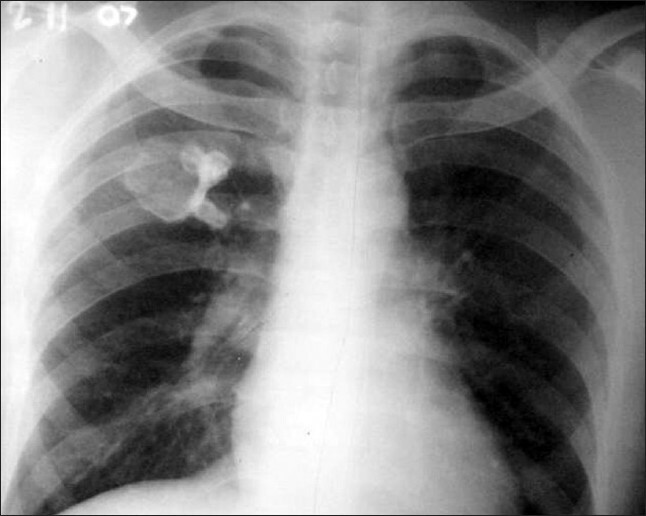 Bronchial masses in young patients are a diagnostic challenge as the signs and symptoms are overlapping. Conventional radiological investigations reveal a mass but are not diagnostic and biopsy remains the only means of preoperative diagnosis. Functional imaging is now emerging as an important tool in the evaluation of these patients and may have a potential to suggest a possible diagnosis. 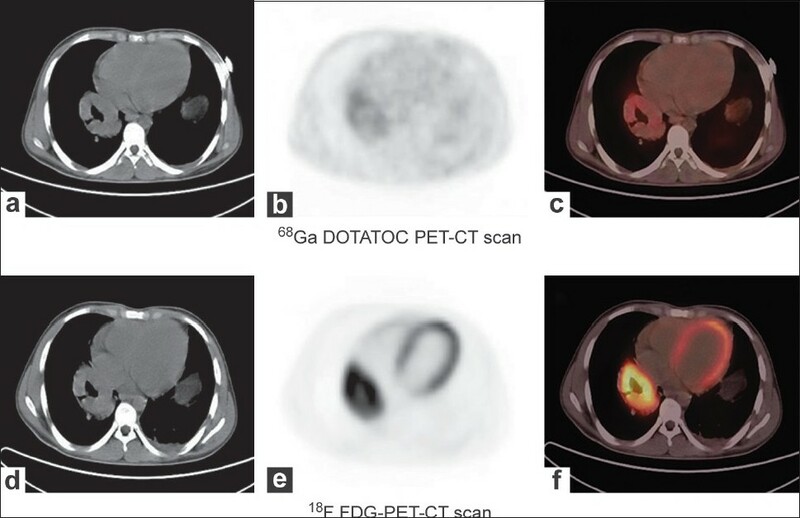 A combination of 18 F-FDG PET-CT and 68 Ga-DOTATOC PET-CT scan is one such example, which revealed contrasting findings in two patients that are being presented here. In recent years, higher medical education has witnessed major changes in the structure and content of postgraduate medical training. 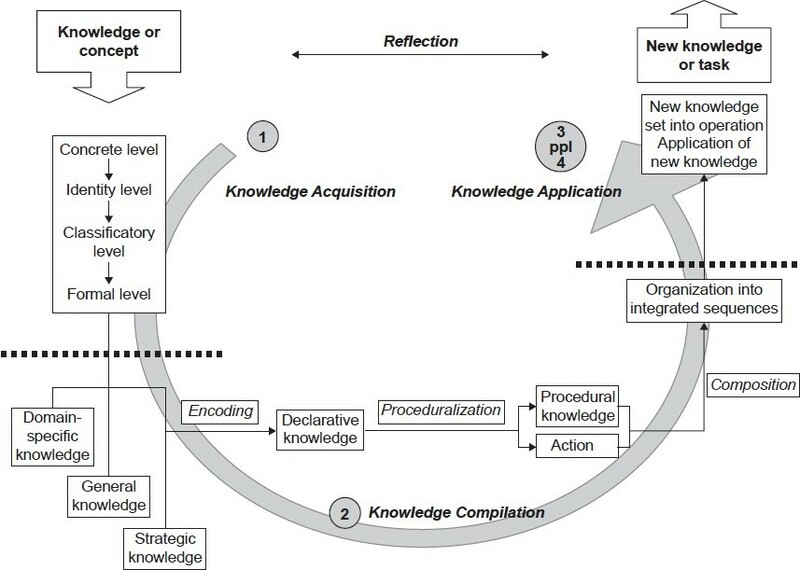 Seven professional competencies have been described that address the medical doctors' ability to effectively communicate and transfer medical information, interact effectively and professionally, and demonstrate a good grasp of clinical knowledge and skills. Proficiency in didactic skills, however, is an important competency that has not received prominent attention. In the clinical setting, attending-physicians and medical residents are responsible for teaching. Consequently, several medical institutions have proposed the need for teacher training programs to improve the teaching skills of attending doctors and medical residents. The supporters of these programs believe that through teaching, medical doctors improve their individual professional and clinical problem-solving abilities. Hence, it is logical to assume that didactic skills' training would contribute to the professional development of doctors. In this paper, we re-examine the underlying theory of the didactic proficiency, how it relates to the clinical setting, and why it may be beneficial for the professional training of medical residents. Atherosclerotic plaque rupture and local thrombosis activation in the artery cause acute serious incidents such as acute coronary syndrome and stroke. The exact mechanism of plaque rupture remains unclear but excessive degradation of the extracellular matrix scaffold by matrix-degrading metalloproteinases (MMPs) has been implicated as one of the major molecular mechanisms in this process. Convincing evidence is available to prove that extracellular matrix metalloproteinase inducer (EMMPRIN) induces MMP expression and is involved in the inflammatory responses in the artery wall. The inflammation and MMPs have been shown to play a critical role for atherosclerotic lesion development and progression. More recent data showed that increased EMMPRIN expression was associated with vulnerable atherosclerotic lesions. Therefore, we speculate that EMMPRIN may be pivotal for atherosclerotic plaque instability, and hence inhibition of EMMPRIN expression could be a promising approach for the prevention or treatment of atheroma instability. Many drugs are implicated in causation of disulfiram-like reaction. The disulfiram-like reaction can vary in severity and can occasionally be fatal. The reaction is believed to result from inhibition of metabolism of acetaldehyde to acetate by inhibition of aldehyde dehydrogenase. The increase in serum acetaldehyde results in unpleasant clinical manifestations. Metronidazole is known to cause disulfiram-like reaction. Although no previous report has implicated ornidazole in causation of disulfiram-like reaction, caution has been advised with the use of all imidazoles. We report the case of a 48-year-old male, who was taking ornidazole and developed features of disulfiram-like reaction after taking alcohol. The patient was managed with supportive measures and improved. The report highlights the need for clinicians to advise patients to restrict intake of alcohol if they are being prescribed imidazole derivatives. Conventional oral steroids like prednisolone have various adverse effects both during short-term and long-term use. Hence a search for an alternative oral steroid with fewer side-effects is underway throughout the world. Deflazacort, an oxazoline derivative, is a step in this direction. The number of large randomized trials using deflazacort for steroid-responsive disorders in children is limited. Use of deflazacort has been explored largely in patients with Duchenne's muscular dystrophy. Preliminary data suggest reduced osteoporosis, lesser growth retardation and weight gain with use of deflazacort, as compared to other steriods. In view of the limited data demonstrating superiority of deflazacort over the available oral steroids and its prohibitive cost, it is early to advocate widespread use of this drug in children. Drug discovery has evolved through various stages into more rational and evidence-based drug designing. Compared to conventional methods which were time consuming and less logical, new drug designing based on structure is rational, evidence based, faster and more scientific in nature. In the era of modern medicine, where newer insights into molecular level of disease processes are available, it is very essential that drug designing be based on molecular mechanism of pathologic processes. Structure-based drug designing has made tremendous contributions in the field of cancer chemotherapy, drug resistant infections, neurological diseases, to mention a few. 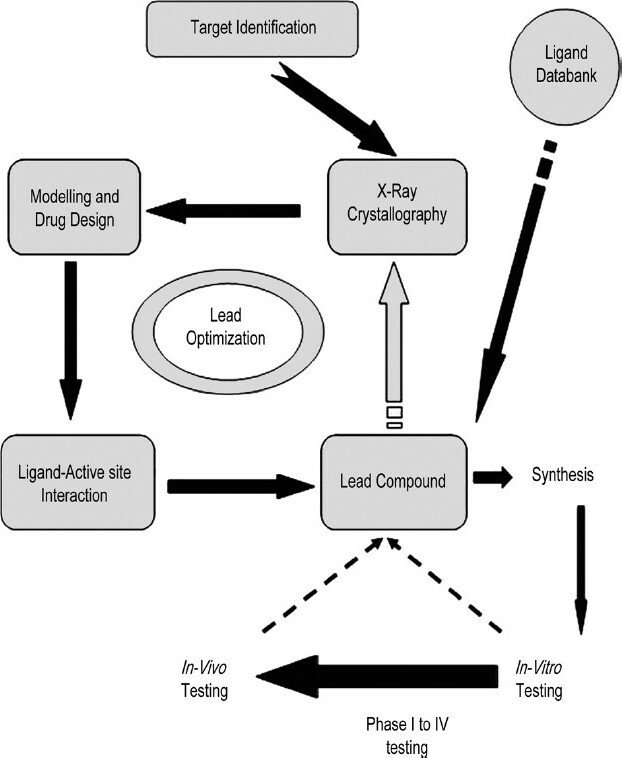 New drug discovery methods are furthered by developments in the technology especially computers, bioassay techniques and calibrated instruments. Computational structure-based drug designing opens the door to novel treatments in modern medicine. An increasing number of patients under 40 years of age are being hospitalized with the diagnosis of acute myocardial infarction. This is partly due to the increased prevalance of risk factors for atherosclerosis in the younger age group; especially increased incidence of impaired fasting glucose, high triglyceride, low high-density lipoprotein levels and increased waist to hip ratio. However, non-atherosclerotic coronary artery disease or hypercoagulability should also be investigated or at least suspected in the younger patients. The pathophysiology of different clinical conditions and disease states which cause acute coronary syndromes in the young patients are reviewed, and the diagnostic modalities and therapatic options for these conditions are briefly discussed by searching for "premature atherosclerosis", "hypercoagulable states", "risk factors for atherosclerosis in youth", "novel risk factors for atherosclerosis", "non-atherosclerotic coronary artery diseases" in PubMed.